24 7 News Net - Cassandra Williamson murder in St. Louis! Bizarre connections in rash of US Kidnappings! BIZARRE CONNECTIONS IN US KIDNAPPINGS! FAMOUS PSYCHIC PREDICTED DETAILS OF CASSANDRA MURDER! 8/01/2002 - Double Kidnapping fits Pattern in this article! A bizarre pattern in the recent rash of kidnappings in the USA repeated itself today. When you see the maps below and read this article YOU WILL BE AMAZED. I guarantee it! Cassandra "Casey" Williamson was killed by John Johnson in Valley Park located in St. Louis County in Missouri. Once again the letters that are needed to spell RAMS or MARS appears in the victims name as he has many times in the recent past! Once again a NINETY DEGREE TRIANGLE APPEARS when the new death location is connected to past locations! This pattern was written about in a letter from a world famous psychic to one of his fans. His column is carried by several web sites. It's called Ask Sollog. Fans of the world famous mystic send him questions, then he answers you on his site. The answer of Sollog is then picked by his many fans and posted all over Usenet in news groups discussing his amazing writings. As Sollog explained in his answer, the famous Jon Benet RAMSey murder was connected with Gematria to the Elizabeth SMARt murder/kidnapping. RAMSey the first four letters spells RAMS as in a sacrifice in ancient biblical times. RAMS backwards is SMAR or the first four letters of Elizabeth SMARt. RAMS is also an anagram of MARS. Today's victim followed the pattern Sollog explained less than a week ago. cassandRA williaMSon. You can spell RAMS in direct order in her name! That's just the first pattern he pointed out in column that just repeated itself. Sollog explained a bizarre connection in his article to famous UFO sites and the locations of the kidnappings. He also pointed out how ROSWELL when connected to some of the sites formed triangles. One was a near perfect 90o (ninety degree) triangle from Roswell to San Diego and Oregon City. This same size 90o triangle also appears in the new kidnapping at St. Louis. 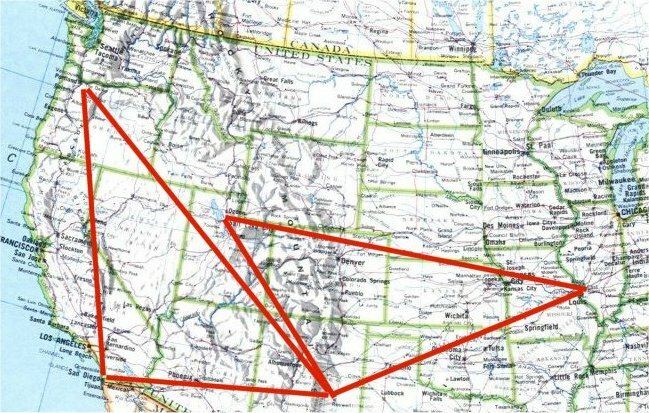 Roswell when connected to Salt Lake City and St. Louis forms the exact same triangle Sollog had in his article about how the locations were interconnected to each other in the rash of kidnappings! Salt Lake City (SLC initials) and St. Louis County (SLC) are again connected with the same letters of the locations! SAINTS is a new connection that Sollog pointed out to me today in phone call. He said, Salt Lake City is the home of Mormons or the Church of Latter Day SAINTS. San Diego is named for a Saint. ST Anton (Stanton) was the site of the Runnion kidnapping. ST Louis County the new location! FOUR SAINTS have appeared in this bizarre rash of kidnappings! The most freaky thing about all of this is, the very FIRST LETTER Sollog ever wrote for his ASK Sollog column was addressed from a JJ (Jay Jay). In it Sollog explained NUCLEAR TERRORISM was about to hit Israel, Rome Italy and Washington DC. Sollog put the name CASSANDRA in the letter to JJ. John Johnson was the killer of Cassandra! Fans of Sollog are discussing this amazing connection in the recent murder of Cassandra to Sollog's Ask Sollog column! Here is the first Ask Sollog letter mentioning JJ and Cassandra! In the same Column of Sollog was another letter written in April, Sollog warned in that April letter that a major NEAR MISS of a NEO (near earth object - asteroid - comet - etc.) was about to occur. Last month NASA tracked the largest asteroid to ever miss earth going back at least 100 years! In that same warning Sollog stated, around 2020 a MAJOR ASTEROID (neo) might strike the earth and kill almost all living things! Last week we learned NASA had just found such an object ON TRACK TO POSSIBLY HIT EARTH around 2020 or 2019! To date Sollog has only written 10 replies in his famous Ask Sollog COLUMN. One was about a CASSANDRA and a JJ! Another was about a NEAR MISS NEO and a FUTURE KILLER NEO! The last was about how RAMS keeps connecting to MURDER VICTIMS and 90o triangles to Roswell. Again, all of these letters were posted to USENET and are TIME STAMPED by Google as the links above PROVE. It really happened! Sollog also told me how two major new LINES OF TRAGEDY have formed on a map of the USA by connecting recent headline tragedies to ROSWELL! 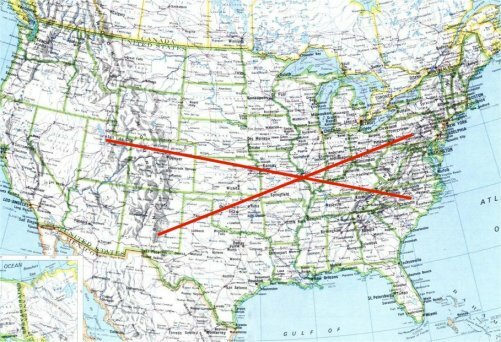 Salt Lake City (Smart murder) St. Louis (Cassandra murder) and Fort Bragg NC (where FOUR MILITARY MEN killed their FOUR WIVES in SIX WEEKS recently) form a perfectly straight line. ROSWELL (famous UFO crash) St. Louis (Cassandra) and Somerset PA (miner cave in) form another straight line! The two lines intersect in ST LOUIS COUNTY the site of today's sacrifice as Sollog called it! Stanton and Ellsinore are two towns in Missouri Sollog told me to connect on a map of Missouri. Stanton (St Anton) was where SAMantha Runnion lived. Lake ELSINORE was where the killer of Samantha Runnion lived. Look at this map of Missouri. 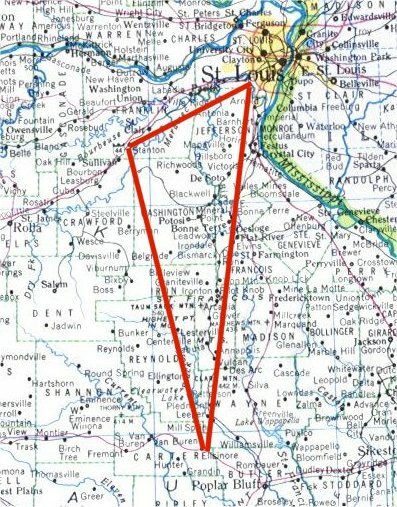 SEE THE SAME 90o TRIANGLE form when the murder of Cassandra is connected to locations in her state connected to the Runnion murder! Now some FOOLS are going to read this and say COINCIDENCE. Others that read Sollog's claims that the murderers are UFO ABDUCTEES PROGRAMMED TO KILL to give A SIGN that what Sollog says about NUKES is real, will shake their heads and say, FOUR MILITARY MEN IN ONE BASE MURDER THEIR WIVES IN SIX WEEKS! ALL THESE KIDNAPPINGS WITH CONNECTIONS TO LOCATIONS AND NAMES, IT CAN'T BE COINCIDENCE! On the phone to me today Sollog warned, "THESE SIGNS ARE PART OF THE SLAUGHTER OF THE INNOCENT THAT I WARNED OF IN 1995! THEY ARE THE SIGNS THAT NUKE TERRORISM WILL SOON HIT ISRAEL, ROME AND WASHINGTON DC!" Fans of Sollog KNOW HE HIT TEN STRAIGHT EARTHQUAKE WARNINGS in the past two years! Fans of Sollog know THE FBI WAS IN OUR PUBLISHERS OFFICE AFTER 911 BECAUSE WE HAD A SOLLOG WARNING ON OUR SITE ABOUT MAJOR TERRORISM IN NYC IN SEPTEMBER AT THE WTC BEFORE 911 OCCURRED! SOLLOG writes AND THE FUTURE OCCURS IN HIS WORDS! Fans of Sollog say HE IS GODS PROPHET OF JUDGMENT! Skeptics don't believe him like skeptics mocked CASSANDRA! When ISRAEL, ROME and DC are nuked, REMEMBER WHO WARNED YOU! Check out the books below THEY EXPLAIN THIS AMAZING STORY if you're new to Sollog. Sollog has authored over 30 books. You can download FREE SAMPLES at Sollog's Book Site. A double kidnapping occurred today. It fit the bizarre patern mentioned above! Tamara Brooks and Jaqueline Marris were the victims. taMARa brookS - MARriS, the word MARS appears in their names! LanCaSter CA was the site they were kidnpped in. SLC appears in the location! This headline kidnapping is located on the line drawn on a map from San Diego to Oregon city. The Samantha Runnion kidnapping was on this line as well. The Van Dam kidnapping in San Diego was on this line. Two girls were kidnapped in Oregon City on the same line! 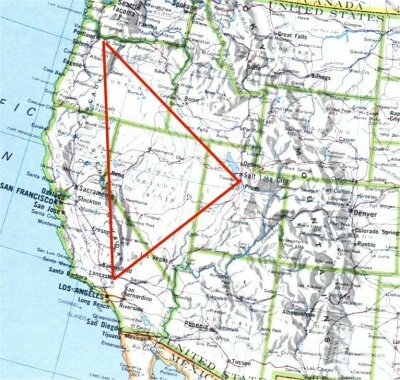 Another 90o triangle is created by connecting Lancaster CA to Salt Lake City and Oregon City the locations of previous kidnappings! The Hebrew name of God is prominent in the story again, since the girls were rescued at Lake Isabella (bELla).